Review by AllTheBestFights.com: 2015-06-19, Patricio Freire vs Daniel Weichel gets three stars only thanks to a good finish. The black belt in Brazilian jiu-jitsu Patricio Freire entered this fight with a pro mma record of 23-2-0 (74% finishing rate) and he is ranked as the No.4 featherweight in the world (currently the #1 in this division is Jose Aldo). He suffered his last defeat in 2013 when he faced Pat Curran (via split decision, Curran vs Freire), since then he has won six consecutive bouts taking revenge on Curran in 2014 (fight valid for the Bellator Fw title, Curran vs Freire 2) and beating Daniel Straus in his last fight (=Freire vs Straus 2). His opponent, Daniel Weichel (black belt in Bjj as well), has a record of 35-8-0 (74% finishing rate) and he entered as the No.9 in the same weight class. His last defeat occurred in 2012 when he lost his M-1 Global lightweight belt against Musa Khamanaev (=Khamanaev vs Weichel); after this bout he has collected seven victories winning the Bellator Fw tournament (season 10 – beating Desmond Green in the final, Weichel vs Green) and winning over Pat Curran in his last fight (=Curran vs Weichel). 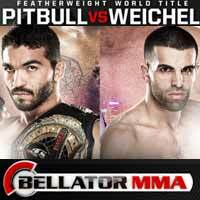 ‘Pitbull’ Freire vs Weichel is valid for the Bellator featherweight title (Freire’s second defense); undercard of Kimbo Slice vs Ken Shamrock – Bellator 138. Watch the video and rate this fight!